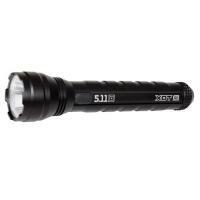 5.11 Tactical, a world leader in the production of high-quality tactical goods, continues their superb track record with the XBT Flashlight. Constructed from aircraft-quality anodized aluminum, the XBT packs incredible power into an ultra-durable body. Powered by six AA Duracell® batteries, the power-smart Cree® XP-E LEDs project a dazzling 650 lumen beam that reaches an impressive 328 meters. Designed for versatility, this handheld flashlight features three different lighting settings to cover a wide range of applications. Because dependability is a necessity in the field, a regulated power circuit adjusts power output to prevent overheating, while gold plated contacts ensure reliable activation every time. An anti-roll design and stamped metal pocket clip prevent accidental loss. Confidently carry the XBT into any environment and situation knowing the resilient body resists damage from water and shock. Dimensions (Length x Body Diameter x Head): 10.25" x 1.58" x 2.28"